Charles Ford – the 1841 census shows that Charles Ford was occupying the property which we now know by the name of ‘The Royal George’. Charles was aged 30 living with his wife, Maria also aged 30, and their son, James aged 4 years. When James was baptised on 16th August 1837 Charles was working as a labourer. When the information for the 1840 Tithe Survey was collected Charles Ford was occupying a property owned by John Hodges in Colwell Street Lane (now 22 Gloucester Road). By the time the next child, Henry, was baptised in January 1840, Charles was shown as a publican. This gives us the impression that the property was used as a beerhouse as early as 1840 or even before. Charles and Maria had more children. Mary was baptised on 1st May 1842 when Charles is shown as a hallier (note this doesn’t rule him out from running the beerhouse as it was common practice to have two occupations and several later licensees of the Royal George ran a carrier business as well). Edward Charles was baptised on 16th June 1844 when Charles was shown as a farmer in Morton. So this shows that by 1844 Charles had given up running the pub and moved out of town. Another son, Leonard, was baptised on 20th January 1847 when they were still in Morton, but he died after only 10 weeks. Maria died in 1849 aged only 38. We cannot trace Charles or any of his children after this event. Richard Cowle – the 1851 census shows that Richard Cowle in occupying the property. In 1841 census Richard appears to have been living with George Hodges in their house in Colwell Street Lane. Richard was a carpenter aged 25 so he was presumably working for George’s father, John Hodge. On 25th December 1842 Richard married Ann Prewett. Ann had been baptised on 25th February 1820, the daughter of James Prewett, an innkeeper and his wife, Hester who were running the White Lion in the High Street. The 1851 census shows that they had settled to live on The Plain – although the census shows Richard as a master wheelwright aged 38 from Shillingford in Berkshire, we know from the 1856 trade directory that he was also a beer retailer on he Plain. This seems to suggest Richard (or Ann) were running the property as a beerhouse. In the 1851 census he was living with Ann, his wife, a corset maker aged 30 from Thornbury and daughter Emily aged 4 who was born in Aust. They seem to have three lodgers living with them. In 1858 Richard moved into Bristol where he became landlord of the White Horse Hotel on the Horsefair (since replaced by Debenhams). It is interesting to note that on 3rd May 1859 Richard acquired the property in the High Street which had been the mansion house owned by William Rolph. We don’t know why Richard bought it nor what he intended to do with it. On 23rd September 1859 he sold the property to the Police Authority and it became the town’s Police Station. In 1863 Richard moved to the White Lion in Bridwell Street (on the site of the old police station). The 1871 census shows Richard in Barr Street in Bristol where he was a licensed victualler living with Ann and two servants. He stayed here as innkeeper until 1877 when he moved 17 Victoria Place in Clifton. The 1881 census shows he was now working as a coach maker whilst Ann was a lodging house keeper. Their grand-daughter, Frances A Chard aged 6 was living with them as well as two lodgers. They were at the same address in 1891 although now Richard had retired and Frances had become a music teacher. Richard died in September quarter 1892 aged 78. George Dimery – for a few years from about 1859 to the mid 1860’s the beerhouse was run by George Dimery. George was baptised in Berkeley on 20th November. He was the son of Joseph Dimery, a farmer and his wife, Hannah. Joseph died aged 36 and he was buried at Berkeley on 30th September 1837. The burial record shows Joseph had been living at Hogsdown. We don’t know what happened to Hannah. In the 1841 census George was living with his grandmother, Elizabeth Dimery, on her farm at Hogsdown. In 1851 census George was still living in Hogsdown which had been taken over by his uncle and aunt, Henry and Elizabeth Mallett, although Elizabeth’s mother, Elizabeth Dimery was still living there. George was a general labourer aged 17. On 12th February 1856 George married Mary Organ at Berkeley. Mary was the daughter of David Organ, an innkeeper at Newport. At the time of the marriage, George was a farmer at Orcop in Herefordshire. Following the marriage, George and Mary appear to have lived in Dursley for a short time as their son, Frederick George was born there in 1856. They had moved to Thornbury by 1859 when their second son, Joseph Henry, was born. He was baptised on 7th July 1861 at the same time as their third son, Alonso Daniel. The 1859 Rate Book shows that George was on The Plain in Thornbury. The 1861 census shows George Dimery was a beerhouse keeper in Colwell Street which was the old name for The Plain. He was aged 27 living with his wife, Mary aged 30 and their sons: Frederic George aged 4 and Joseph Henry aged 1. There were also two servants and two boarders including George Mallett aged 14 from Berkeley. We know that George was involved in the inquest on the death of Henry Burchell in 1861. The details of a coroner’s inquest show that George was driving his horse and trap into Thornbury with his son, Fredrick as a passenger. As they were passing Morton Mill pond, his trap was in collision with a horse been ridden by Henry Burchell who was going back to his home in Stone. George was initially very concerned for his son, Frederick, whom he thought had been run over by the cart wheels and killed. He passed over Frederick to Henry Honeyborne who lived nearby with the words “Oh Dear it’s a bad job I’ve got a dead child”. However when they took Frederick to see Dr Edward Long he found Frederick to be partially insensible, covered in dirt and severely contused. Henry Burchell was not so lucky and he died the following day from the injuries sustained. George and Mary had one other child in Thornbury, Mary Kate, born in 1862. They must have moved about that time as the newspaper notice shown on the right was published in March 1862. He seemed to be selling off an interesting collection of belongings. George moved to Bristol where George became a labourer. The 1871 census shows George’s family were sharing a house with another family at 19 Linden Street, St Phillips and St Jacobs. There were 13 people living in the house. George’s son Frederick had become a pupil teacher. At the time of the 1881 census they were living in another house. George was an unemployed labourer, but Frederick had become a schoolmaster, Alonso a brewer’s assistant and Mary Kate a teacher. The 1891 census shows George and Mary living in Barrow Lane in the same area of Bristol. Both George and Alonso had no occupation. The other children had left home. Mary died aged 70 in December quarter 1900. In the 1901 census George was aged 69, no occupation and boarding in Weston Street, Bristol. It is pleasing to see that George’s son, Frederick, who nearly lost his life when aged only 4, went on to make a success of his life. The 1901 census shows that he was Superintendent of Industrial Schools in Shadwell in Yorkshire. He was aged 44, married with four children. It appears that George may have moved back to the Dursley or Berkeley areas. What appears to be his death aged 76 was registered in Dursley in 1906. George Phipps – was licensee from about 1881 to 1882. George was born about 1840, the son of William Phipps, a blacksmith and his wife, Ann. In 1851 the family were living at Oldbury where George had already become a blacksmith’s apprentice. The 1861 census shows George still living with his parents, although he had now become a full blacksmith. In 1864 George married Hannah Sansum in the Clifton area of Bristol. The 1871 census shows George was a farmer in Kington and that he and Hannah had one son, Henry George aged 4. The 1877 trade directory shows George as a beer retailer in Kington, presumably at the Cross Hands. The 1881 census shows George had moved to Royal George in Thornbury. As well as running the beerhouse, George was shown to be working as a blacksmith, presumably for Mark Savery who was employing two blacksmiths at his smithy next to the Royal George. Living in the Royal George were George was aged 47 and his wife, Hannah aged 37 and their children: George, a blacksmith’s apprentice aged 14, Victor aged 9, Anne aged 7 and Samuel aged 2. George died in 1882 aged 49. Hannah was listed in the Sessional Court as being the licensee in 1882. Hannah re-married by March quarter 1883 – her second husband was William Cullimore from Cromhall. George’s son, Henry George, was listed as a member of the Thornbury Detachment of the 1st Volunteer Battalion of the Gloucester Regiment in 1886 and he was still listed in the unit in 1888 and 1891. The unit disbanded in 1895. William Pullen Cullimore – was licensee from 1883 to 1907. William was born in Cromhall about 1843, the son of William Cullimore and his wife, Martha. The censuses up to 1881 show William stayed on the farm as an agricultural labourer. During that time the farm varied in size, but never more than 37 acres. In March quarter 1883 William married a widow, Hannah Phipps whose husband had run the Royal George until his death in 1882. The Gloucester Sessional Court records show that William took over as licensee of Royal George in 1883 and replaced James Knapp as owner of the property in 1885. The 1891 census William was described as a beerhouse keeper aged 48 from Cromhall living with his wife, Hannah aged 48 and two step-children: Eliza A Phipps, a draper’s assistant aged 16 and Samuel a scholar aged 12. The 1901 census shows that they were still there. William Cullimore was an innkeeper living with Hannah and a step-daughter, Annie Phipps a draper’s assistant aged 26 and a domestic servant Maria Purnell aged 15?. Hannah died in September quarter 1905 aged 64. In August 1907 William let the pub to Samuel Phipps for £35 per year, but William died shortly afterwards. He died in September quarter 1908 aged 64. The Western Daily Press of 13th October 1908 reported the inquest on his death. Apparently he left left the pub about 9 o’clock the previous Saturday morning to go for a walk. Unfortunately he had very poor eye sight which may have caused him to fall into “the slips at the Cricket Ground” where he drowned. The Gazette of 1908 says that it was a pond in the Thornbury Castle cricket ground. At the inquest it was noted that he had been suffering from giddiness. Harry Clark – his obituary which appeared in the Gazette mentions that Harry was ‘a native of Thornbury’. We had assumed that this meant he was born here, but we finally tracked him down as being born in Painswick on 28th January 1875. He was the son of Robert Clark and his wife, Mary A. In 1881 census they were living in Winchcombe where Robert was employed as a Sergeant of Police. Harry joined the Gloucestershire Police in 1895. In 1896 he married Beatrice Ellen Barnett in Winchcombe. 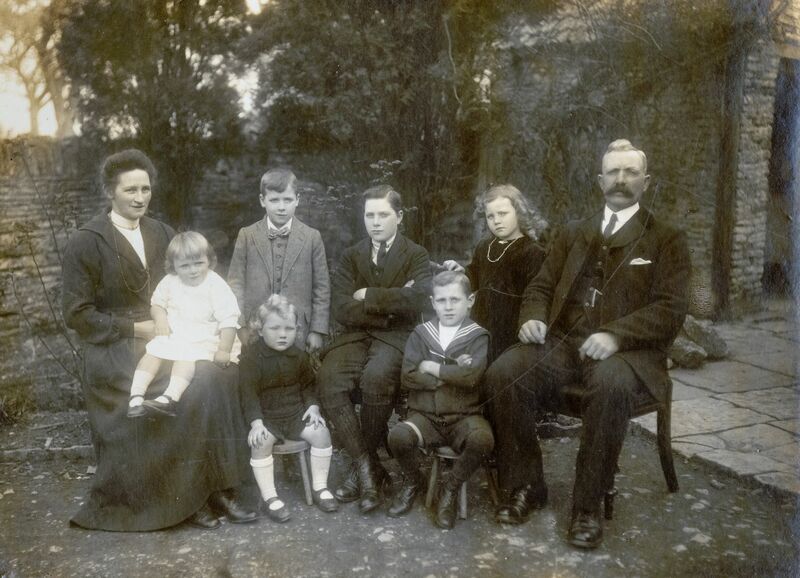 Their first child, Walter Henry was born in Winchcombe but baptised in Thornbury on 23rd July 1897. Various newspaper cuttings indicate Harry was stationed in the town as a policeman, but we don’t know when this was. One newspaper article suggests it was Harry’s father who had been Sergeant in the town for many years. In 1897 when Walter Harry was baptised the family were living in Lower Easton, Bristol. 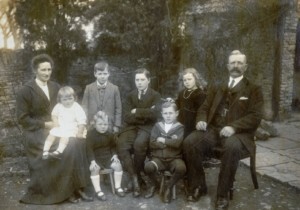 Their second child, Beatrice, was born in Bristol in 1898. The 1901 census shows Harry as a police constable aged 26 living with Beatrice aged 28 from Stanton, Gloucestershire and their children, Walter aged 4 and Beatrice aged 3. Beatrice died in Bristol in September quarter 1912 aged 39. Harry re-married in September quarter 1913 – his second wife was Mary Ann Edwards. Mary Ann was born on 19th February 1875. According to his obituary, Harry worked with the Police at St George in Bristol and then after he was appointed sergeant he was transferred to the C.I.D. in Bedminster and later returned to St George as an inspector. At the time of his retirement in 1923 he was an inspector at the Police Court in Bridewell, Bristol. 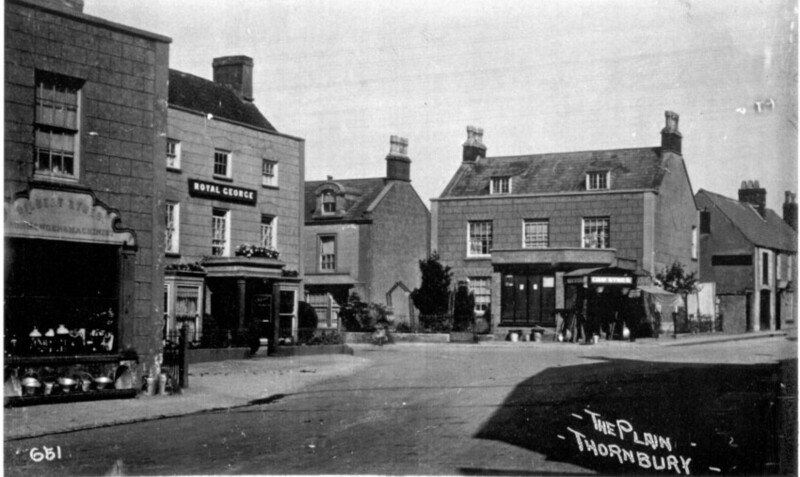 In May 1923 Harry returned to Thornbury to become licensee at the Royal George. He was listed as living there in 1925 electoral register, but by 1926 he had moved The Coombe in Gloucester Road and they were still living there in the 1935 register. By the 1938 electoral register they had moved to Forest View in 3 Severn Drive. The special register compiled in 1939 in preparation for the war shows Harry worked in the ARP Voluntary Service Control Room. 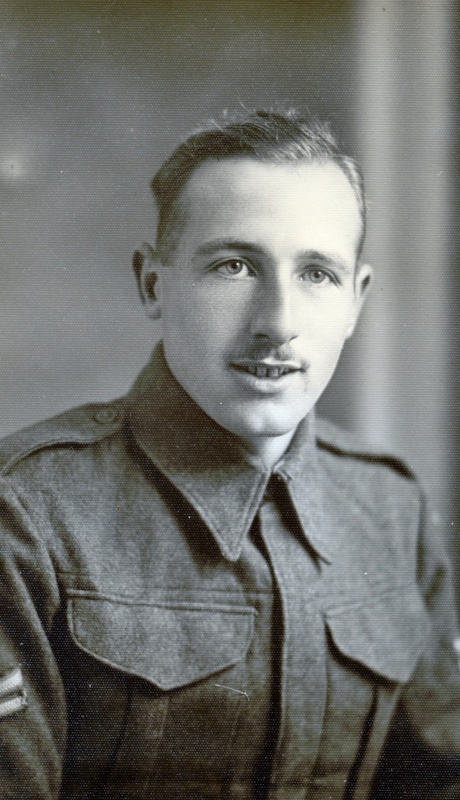 Harry was a strong supporter of the Thornbury Branch of the British Legion serving as its treasurer for some time. He died in 1942 aged 67. Mary Ann was still listed as still living in 3 Severn Drive in the 1946 electoral register but not in 1950. James Parker – the 1926 rate book shows James was the licencee at that time and W. J. Rogers Ltd were the owners. We don’t know any more about James. Frederick Tom Ball – was licensee from about 1931 to 1944. Frederick Tom was born in Woollaston near Chepstow on 28th August 1877. He was the son of Samuel Ball, a fisherman and his wife, Margaret. The 1891 census shows the family living in Netherend, Woollaston and Frederick had started his working life as working as a labourer in a paper mill. He married Alice Eliza Boughton in the Chepstow area in June quarter 1905. Alice was born on 3rd June 1880. They had several children including: Samuel Thomas born in Cheltenham in 1906, Ernest Frederick in 1913, Victor J in 1914, Laura Elizabeth born on 21st June 1915, Leonard Charles in 1918 and Reginald Arthur in 1919. In the register compiled in 1939 in preparation for the war only Laura was living at the pub with her parents. Samuel jnr married Ellen Emma Josephine Jenkins in the Chipping Sodbury registration district in 1931. Ernest Frederick married Rhoda Lois Symes on 16th October 1933 and they settled to live in 73 High Street. Laura married policeman John Clark. Leonard married Nancy I. Frankcom in 1951. Reginald married Marie Audrey Shipp in 1941. Click on the thumbnail shown above to see a photo of the Ball family. Frederick served for 28 years with Gloucestershire Constabulary at Gloucester, Cheltenham, Bibury and Stoke Gifford. When he retired as a police inspector in 1931 he bought the Thornbury Coal Company and the Royal George in Thornbury. He put his son, Ernest, in charge of the Coal Company and Leonard and Reg drove the coal wagons. Frederick himself looked after the Royal George, which he continued to do for 15 years. Frederick died on 14th October 1944 aged 67 years. Three of his sons, Corporal Victor, Driver Leonard and Sergeant Reginald, were unable to attend their father’s funeral because they were serving overseas with the Forces. We believe that the image below on the left was taken of Reg just before this time as he appears to have only two stripes on his sleeve. Reginald Henry & Enid M Allchurch – we are not sure when Reginald first became involved with the Royal George. In the special register compiled in 1939 in preparation for the war Reg was living with Enid at Normandy in Gillingstool. Reg was then working as instructor at the ARP School at Falfield. The register shows that Enid’s mother, Mary Cope, was living with them. She was born on 30th January 1890 and noted to be incapacitated. In 1939 when their daughter, Rosemary Sylvia, started at the Council Upper School the family’s address was The Royal George. We had assumed that Frederick Ball was licensee until 1944 when he died, but perhaps he left earlier or Reginald was a manager at the pub. Reginald Henry was born in Oxford on 5th December 1899. He was the son of Thomas Allchurch, shown in the 1901 census as a musician (cornet player), and his wife, Louisa. It is interesting to see that in 1914 Reginald enlisted in the Royal Warwickshire Regiment. He was only 14 years 200 days and described as height 4ft 11 and a half inches, weight 81 lbs and 30″ chest, blue eyes and flaxen hair. Unsurprisingly he was discharged 6 days later on the grounds of ‘irregular enlistment’. At least he tried. Good lad – we don’t know whether he tried again when he was a more acceptable age. Reginald married Enid M Cope in December quarter 1934 in Birmingham. Enid was born on 6th May 1913. Their daughter, Rosemary Sylvia was born in the Aldershot area on 8th October 1935. We understand that during the Second World War Reg served in the Thornbury Home Guard. Reg was still listed as being at the Royal George in 1951 electoral register, but had moved away by 1952. He couldn’t have gone far away from Thornbury as he was buried in Thornbury Cemetery when he died 31st January 1974. We don’t know much about Enid except that she was referred to as ‘Topsy’ on Reginald’s monumental inscription. William Evans – from 1952 until the 1970’s the licensee was William C Evans. William had married Doris Victoria C Panting in the Bristol area in March quarter 1938. She had been married previously when as Doris Luckes she married Gordon R Panting in Bristol in September quarter 1924. Paul & Tessa Low – the Town Guides of 1981 and 1984 show that Paul and Tessa were the licencees at that time. They took over the George in 1978 and were there until 1985 when they moved to Cheddar. We don’t know anything about the licensees of The Royal George since then. In the last few years it has been greatly refurbished and was converted into a Mediterranean style restaurant called Mezze @Royal George before reverting to its original name in 2017.